Large cuts are looming at the TBAP multi-academy trust, which runs schools in London, Essex, Cambridgeshire and the North West, following accusations of financial mismanagement, say education unions today (Friday). The TBAP trust, which teaches children excluded from mainstream education, plans to cut over £2.5m (14.4%) from its budget, say the unions. UNISON, which represents school support staff in the chain, recently wrote to the Education and Skills Funding Agency (ESFA) raising serious concerns about financial management at the trust. The ESFA warned the trust in January, and has now put TBAP under financial notice to improve management, control and governance in all its schools. The unions find it particularly worrying that the Department for Education continued to allow the trust to take on new schools, when it knew the trust was in financial difficulties. Unions say the rush to make such severe cuts will damage pupils and put teaching and support staff jobs at risk. There is also concern that employees who are not made redundant could see their salaries cut. If jobs go, unions fear vulnerable pupils will need to be taught in larger groups. This could not only disrupt their learning, but also risk their safety and that of staff. The trust is also suggesting that online learning could be an alternative to the classroom so it can cut back on staff, say unions. 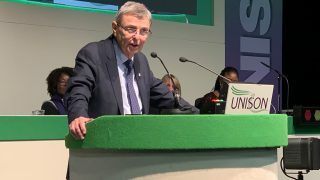 UNISON head of education Jon Richards said: “The ESFA needs to do a full investigation into how the TBAP trust got into such a mess, and provide stability for pupils and staff. GMB national officer Karen Leonard said: “Severe cuts would mean vulnerable children losing desperately needed support, violent incidents could increase, and staff will no doubt be fearful that they will lose their jobs. NASUWT general secretary Chris Keates said: “The ESFA must provide a period of stability for staff, pupils and parents and not add to the distress and anxiety caused by its appalling financial mismanagement. “The situation is completely unacceptable and the proposed cuts will directly harm the quality of education being provided to some of the most vulnerable children. The education unions believe the trust is attempting to railroad through a consultation on the cuts – with a final decision on the outcome due as early as the week after next. – TBAP runs 11 academies in England. – The ESFA put TBAP under financial notice to improve in August 2018. – The unions are meeting TBAP on Tuesday (25 September). They are calling on the trust to put the cuts on hold to allow for a proper consultation with staff, parents and local politicians, and the opportunity for alternative savings to be considered.